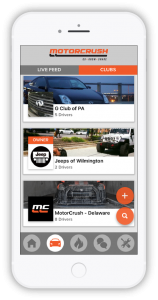 You may know MotorCrush as the social network built just for car enthusiasts- but the newest feature is going to add some serious horsepower to your club like you have never experienced before. It's called MotorCrush Clubs and it is here to bring your group of like-minded enthusiasts to the next level. Instead of jumping back and forth between different messaging platforms, communicate with all of your club members in one central location. Share news, club updates, and announce and plan car meets within your club. Use MotorCrush's global community to find and invite new members and raise awareness for your club and events. Track who has RSVP-ed to your events within your club for better planning and share your events to all users through the check-in on the live feed. Club Members can now get their automotive or motorsports fix anywhere, anytime and connect, even in the off-season. Use clubs to find and share car mods amongst members and create friendly competition for the next best mod. You can use MotorCrush to create niche communities - just head to the app and navigate to the "Clubs" tab. You can build these communities around a specific make, track, business, local club chapter, geography, group of friends, or whatever you want. Name your club something that others will understand and choose whether your club is public or private. Anyone with a MotorCrush profile can be added or invited into these clubs. Once you have established your club, activate your club chat by clicking broadcast. The message will be pinned to the top of your group chat. Ready to get started? Yea, we thought so! Download version 2.1 of MotorCrush to bring your club to the next level.